Chop off fourteen inches of your hair AND decide to go platinum. Agree to foster a cat. Yup. All three of those things did happen to me this month. The poor beau. But change is certainly good. With the change of the calendar year, I’ve started to reflect on the goals I set for myself last year, and what I’d like to accomplish over the next 365 days. This post has already been written but will not be shared until next week, when my biggest change will be set into motion. Happy New Year my friends! 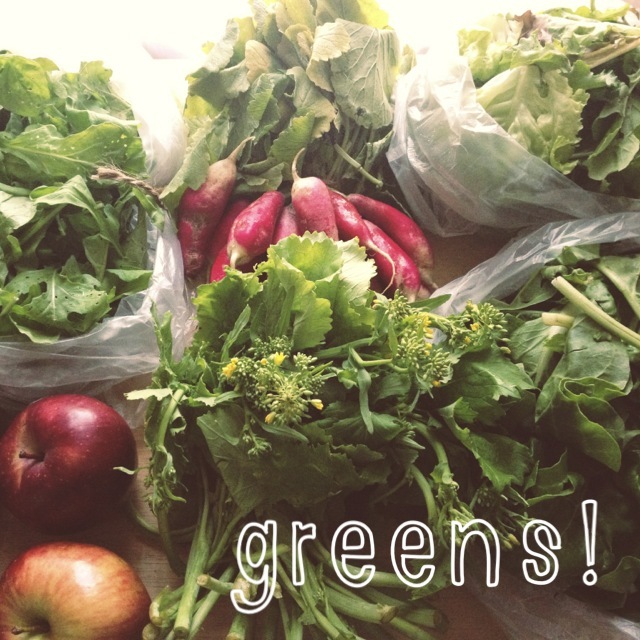 Gosh was I excited when I saw all those greens; just what the body craved! 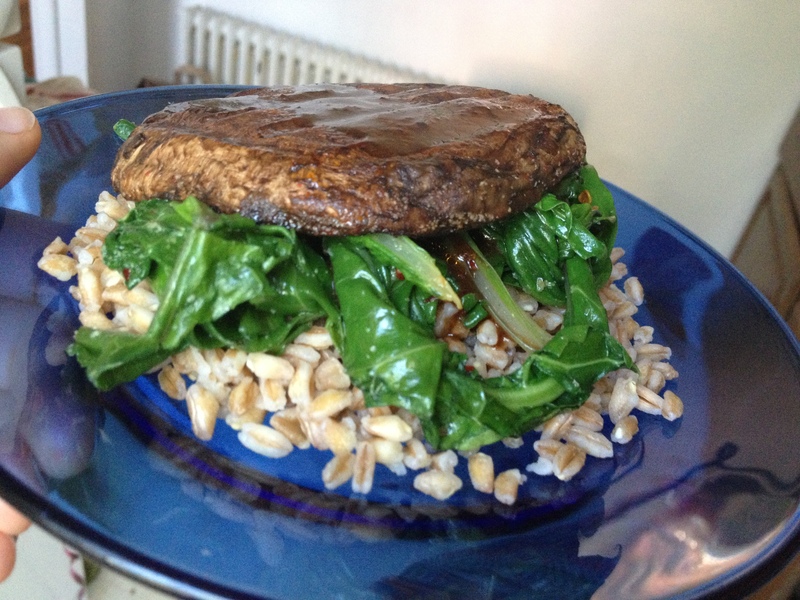 I had a few extra moments in between shifts last night so I whipped up a super simple, super quick meal for the beau and I: marinated and “grilled” portobello mushrooms with braising greens and farro. First things first, get your mushrooms marinating. I used the dressing that I put on my salads throughout the week: a little squirt of sriracha, a little pour of balsamic vinegar, a little scoop of dijon mustard, a dash of EVOO and plenty of fresh black pepper. Whisk and pour over those puppies, I mean mushrooms. Start the water for the farro- I prefer to use the quick 10 minute farro from Trader Joe’s- just pour it in, boil for 10-12 minutes and drain like you would pasta. Bam. Saute the braising greens in a little EVOO, garlic and crushed red pepper. I used that whole bag above and it wilted down to two small servings; perfect for dinner. I “grilled” our mushrooms on the George Foreman- only took like 5-6 minutes and the clean up was easy. While the mushrooms were cooking, I heated the leftover marinade on the stove at a low temperature to thicken it up a little- I later poured this over the mushrooms once on the plate. Pile high and dig in! Can’t get any easier than that. I’ll share plenty of photographs and recipes if they come out as keepers. Stay happy, healthy and active my friends! 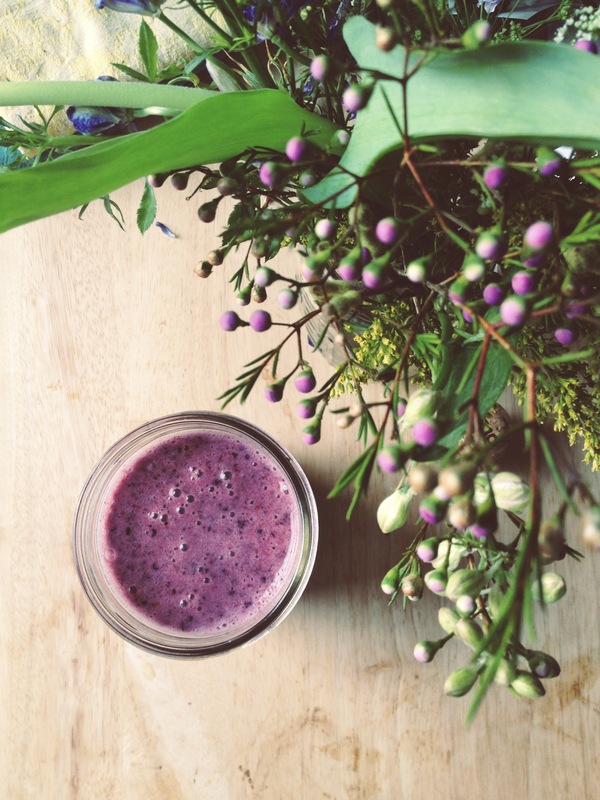 Filed Under: clean eating., recipe., Troy goodness., vegan, welcome spring!, yet another list. Unlike the past three months, April will not have a physical goal/challenge. Instead, I’m going to focus on my new apartment and new beginning with the beau. I’ve always thought of myself living a pretty simple life but once I had to pack it all up and move it- goodness do I have a lot! I may not have a couch, television, end tables, coffee tables, etc but I do have plenty of clothes, shoes and handbags. More than enough actually. These four mini goals are not only attainable, but beneficial to my mental health. My new home won’t be cluttered. I won’t be overwhelmed by too many options in the morning and it’ll help me get back into routine. We’re finally back to cooking each meal in the new tiny kitchen- and yes, we have even less counter space. The past few days have consisted of morning shakes, leftovers from the holiday weekend and red wine. I did take a long trip to the market on Saturday to stock up and let me tell you, it gets expensive! I am surely looking forward to our weekly veggie delivery to pick back up next week. Are you looking forward to something special this month? Doing any Spring cleaning? Filed Under: monthly challenge!, new goal., tiny apartment., yet another list. I’d prefer to drink wine from Ball jars. And water. And my morning smoothies. Tomorrow’s lunch is going to be a big salad with FG lettuce, wild rice, baked sweet potatoes, scallions and a Dijon mustard vinaigrette. And a side of sliced FG apples. The beau and I picked up some new items for our new apartment: sheets, comforter, bathroom rug, Meyer hand soap, dish scrubber thingy, and kitchen towels. Mr. Fuji in Clifton Park is our new favorite sushi place. The rolls are generously sized, the vegetables are fresh and the service is great. On Easter, the beau’s (almost) entire family is going to meet my parents and sister. This video shows my ultimate dream: to be an urban beekeeper and to have a garden of vegetables and flowers. I love rolling/counting change. My tips from the past few months is a huge chunk to put toward a couch. Running still hasn’t “clicked” for me, yet. Three miles this morning along the river was harder than anticipated. It’s hard for me to imagine that my friends are actually old enough to become parents but it’s also exciting. As I wandered through the store to find something special, I drifted into the baby section just to peek… can I just say that little girls have the cutest outfits ever?! I have two other special women in my life that are pregnant and I cannot wait to shop for their little ones! And them too! Can’t forget about the mommas out there! 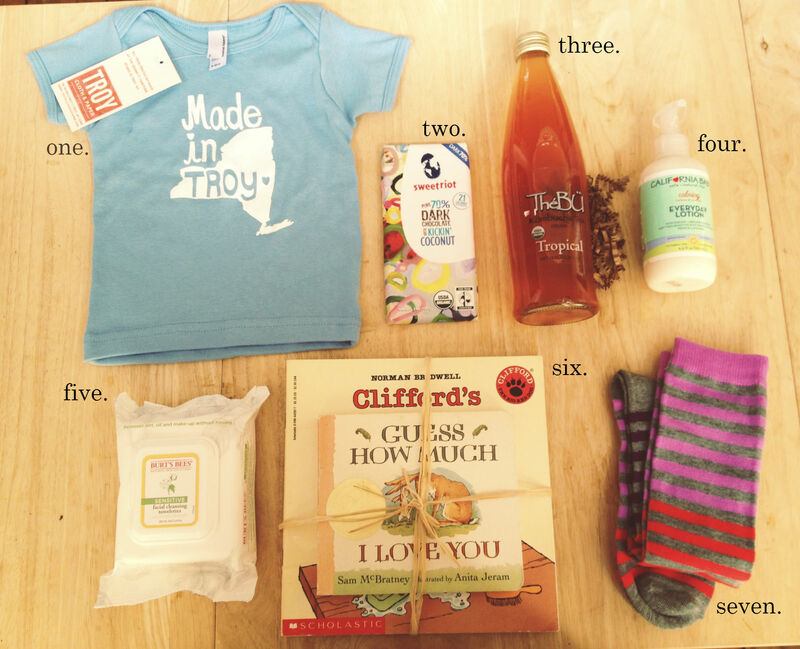 Do you like to give care packages or stick strictly to the registry?